Although just how far back they go is unknown, the breed has been used an all around farm dog in Scotland and England for centuries. The Collie originated from several different herding breeds from Scotland and Wales and was likely later crossed with the Borzoi for a more "noble" look. The Collie is not commonly used for herding anymore because of its replacement by the Border Collie, but it still makes for a devoted family pet. The Collie was recognized by the AKC in 1885. 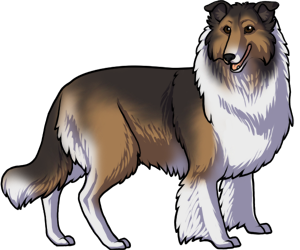 The movie star "Lassie" was a Rough Collie. The Collie has two coat variations, Rough and Smooth. The Rough being long haired and the smooth being short haired.